Why did you join Venturers? 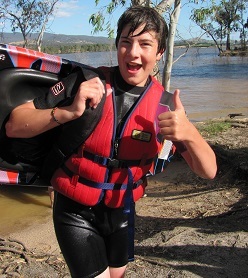 I joined venturers so I could get involved with more outdoor education camps, and to meet people with similar interests and to be part of my home community. What are your favourite activities at Venturers? My favourite activities are defiantly all the sailing and water sports that we do as Sea Scouts, along with the large wide games including 'Get Lost' which is a large scale race teaching you the use of a GPS. What is your greatest achievement in Venturers? So far, 'Outdoor Certification 2'. I am hoping to achieve my 'Venturer Award' soon. What was the best camp you have been to and why? Hoadley Hide, you can take this as seriously as you like, the organisation of it is incredible, it's so much fun and you plan your own team, food and activities! What would you say to people who are looking at joining Venturers? Are you ready for a whole new world? In Venturers you have so much independence and you have to be ready to get out of your comfort zone because life time opportunities and experiences found no where else are being thrown at you left, right and centre. What do you think of the Venturer leaders? The leaders have just as much fun as you do, and they are the happiest people in the world, the amount of work they do to help make your ideas and your plans happen is incredible, really they are the best volunteers around. 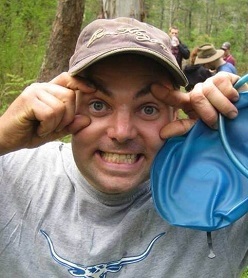 Venturer Leader Profile - Andrew.....aka "Risty"
How long have you been involved in Venturers? I have been involved in Scouting for 26 years. I started as a youth member and moved through all the sections from Cubs to Rovers. Prior to being a Venturer leader I was also an assistant Cub leader. I became a Venturer leader at the age of 20 and have been in this role for 13 years. Were you a youth member? I joined as a Cub at the age of seven and have completed Cubs, Scouts, Venturers and Rovers. What prompted you to train as a Venturer Leader? In my opinion the Venturer section is the most fun section. It's great to be able to teach teenagers new skills, and how to enjoy the great outdoors. It's a great feeling to see improvement in their skills as they grow up in Venturers. What’s the best thing about being involved in Scouting? For me Scouting has always been my community. I have formed many close friendships through Scouting, so close that three of the groomsmen at my wedding were friends I met through Scouts. What sort of activities do you do with your Venturers? Hiking, bush walking, sailing, canoeing, kyaking, paddle boarding, skiing, scuba diving, power boating and camping.....just to name a few. As a leader teaching Venturers new experiences duirng the "Tasmaina Wild Dayz" event and at Hoadley Hide.